Belize security forces are cracking down on persons illegally panning for gold inside Belize’s prestigious Chiquibul Forest. A total of 12 persons have been detained since Friday; 2 have been charged and 10 more await formal charges, including drug trafficking charges, expected to be levied against them on Tuesday morning. Four military officers were ferried from Camp Belizario to bolster the Joint Forces Unit (JFU) based at Ceibo Chico Conservation Post – making the total number of officers on patrol, 12, when they successfully apprehended the Guatemalans. the law, the fine would be a maximum of $50,000. She said that more charges would have been levied had the Guatemalans been actually found in possession of the gold. In this case, she confirmed, they were found illegally searching for gold in Belize. As Amandala had reported in late July, as many as 300 Guatemalans—including young girls—are believed to be operating illegally in that part of western Belize in what is proving to be a very lucrative venture. By foot, they hike into Belize looking for gold. Some of them previously worked the area to extract the xate palm, which has been almost wiped out in the area, but they are now coming for the gold, according to Rafael Manzanero, executive director of Friends for Conservation and Development (FCD), the NGO which co-manages the Chiquibul National Park. The paths that were once xate trails are now being used for gold exploration hikes. The detainees also recount that while traveling on buses in Guatemala, they had heard heavy rumors of “a gold rush” in Belize and the rumors have spread across several villages, from which they come to search for gold inside the Chiquibul on the Belize side of the border. Manzanero said that the people interviewed come from several villages. In the case of Monte Los Olivos, the villagers claim that about 70 people from their village are in the forest looking for gold. They have their turf, said Manzanero, noting that the two persons nabbed on Friday had complained that the persons from Monte Los Olivos had chased them from the area where they had been panning for gold. The last set of persons apprehended totaled 6, and included a minor, 10, who may also have to face drug trafficking charges since marijuana was also found in the group’s possession. According to Manzanero, the group was found with tools and vessels to extract gold, and they carried machetes but not firearms. They told the JFU that they had just started to work in the area, having arrived about 5 hours before their detention. They usually camp for about a week before returning to their homes. At least for one man in the group, it was his second time in the area. “All of them are consistent in saying they sell the gold for 250 quetzales per gram,” Manzanero told us. In interviewing the detainees, the JFU was told the Guatemalans were able to learn where to mine for gold from a Guatemalan man who used to work for Boiton Minerals, the only company licensed in Belize to extract gold. One of the men captured this time confessed that just a few weeks ago, security forces had found him in the area and warned him to leave. The man said that the security forces told them that they were contaminating the water. Instead of leaving Belize, though, he simply went to another stream. Manzanero pointed out that these are the first arrests the JFU has been able to make. Whereas the first two detainees have faced criminal charges in court, Belizean authorities are hoping to process the others in the morning. FCD said that the nine adults and one minor could face charges of drug trafficking, illegal entry, entering the national park without authorization, defacing a natural area, and gold panning. The case of one gold panner detained last year didn’t go this far, Manzanero indicated, expressing the hope that this case results in success. The first two persons detained—a father and son—were already escaping into the jungle but were recaptured. 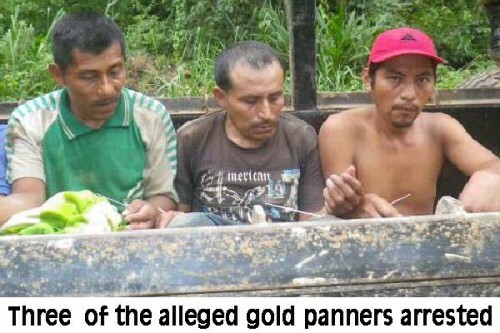 The FCD report said that two Guatemalans were caught red-handed last week Friday panning gold in the Upper Ceibo Chico Creek, located approximately 8.1 kilometers (5 miles) inside Belize. A police report issued Saturday, August 11, reported that at about 1.5 kilometers downstream a creek inside Belizean territory, they found Chrisanto Augustine Chococ, 45, and Santiago Chococ, 19, of El Naranjon Village, Dolores, Peten, Guatemala in the water with some plastic basins in their hands. “They were asked who they were and what were they doing in the area. They both said that they were from Guatemala and that they were digging for gold,” the police report added. The men were asked to present their workers’ permit and other documentation to be in Belize, but they couldn’t, police said. FCD reports that the two men “were then escorted out to the police station after a grueling effort of moving them from the extreme southern area of the Chiquibul forest to Millonario and then to the San Ignacio Police Station. “At the Millonario junction, the two detainees tried to escape from the authorities but luckily enough they were apprehended once more. The Chococs have been charged in San Ignacio Town for illegal entry and illegal mining, police said. On Sunday, August 12, the JFU nabbed 10 more Guatemalans who were found illegally panning for gold in the Rio Blanco Creek area, located approximately 7 kilometers (4.3 miles) inside Belize. The detained man, the FCD report said, is from Zacapa, Guatemala. This amounts to 12 detentions of illegal gold panners since Friday, but the detainees confirm that many more people are operating near Rio Blanco Creek, said FCD. (3) The incorporation of the Department of the Environment into this matter so as to assess and penalize individuals for any destruction and contamination caused and for the leaving of garbage dumps in the headwaters of Belize. Meanwhile, illegal logging inside the Chiquibul continues to be a problem with which the Joint Forces Unit has to contend. Chief Executive Officer in the Ministry of Natural Resources, Alexis Rosado, has affirmed to our newspaper that Belize security forces are not standing down and continue their usual patrols in the area.